This magnificent orchestral studio is built in 1952/53 as a box in box construction, where the inner 'box' is suspended from chains from the outer box. 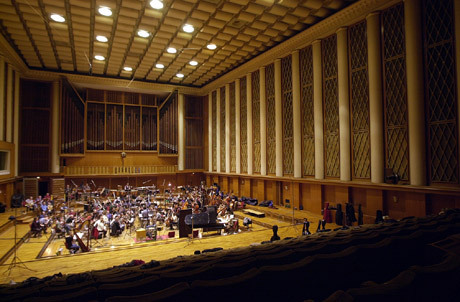 It is extremely silent and served The purposes of both communist propaganda and recording of classic music, pop music, big band for the Broadcast of German Democratic Republic (East Germany). In 1949 all journalist from the four Berlin sectors (American,French,British,Russian) took place in the old broadcast building Masurenalle. After the splitting of Germany into two separate states the journalists from the Russian sector had to leave the Masurenalle. So the government of the GDR decided to built a new broadcast house. The area of the Nalepastrasse was the right place. At first they founded some new radio stations for there political propaganda, then they added a new music production complex. For 40 years this was the home base for two symphony orchestras, one string-dance orchestra, one Big Band and one radio choir. Gear: Genelec 1032 - 4* DPA 4006 Omni - Mobile IO - Mac PowerBook G4 running Digital Performer.